The first rule of driving in the rain is to slow down. Drive at a speed you feel comfortable at, given the weather conditions. By slowing down, you will have more time to react if another car loses control in front of you. And in case you need to slow down even more, take your foot off the accelerator, avoid using your brakes. Hydroplaning can be one of the more dangerous occurrences in heavy rain. This is when your vehicle is actually on top of the water and no contact with the ground. When this happens, you lose or significantly reduce your traction, so try not to make any sudden motions. Just keep calm, take your foot off the gas and keep driving straight. When you come to a large puddle, try not to drive straight through it if you can help it. It is better to drive around or turn around and try another route. When there is a big puddle, it isn’t easy to tell just how deep it really is, and driving through could end with hitting a deep pothole or other driving hazards or splashing water into your Honda’s electrical system. This goes for running water as well. If there is water running across the road, ir could be deeper than you expect or more forceful. Don’t risk you vehicle being pushed around or swept up in a current. And if you do drive through water, tap the brake pedal lightly to help dry your rotors after. When it’s raining, you need to brake earlier and with less pressure than you would in dry weather. That means you need more stopping distance between you and the vehicle in front of you. This will also help the drive behind you know that you’re slowing down or stopping with a bit of extra time. As a rule of thumb, keep more than 3 seconds of distance between you and the car you are following when the weather is bad. And with large trucks or buses, try to avoid passing them at all. The spray from their tires can make it extremely difficult to see, so if you absolutely have to pass them, make it as quick and safely as possible. With rain comes dark clouds, so turn on your headlights to help you see better and to help others see you. But avoid your high beams, the extra light will just bounce off the rain, being more distracting for you, and blinding for others. And if the rain causes your windshield to fog up, turn on your window defrosters immediately. Switch on the AC so the fog clears as quickly as possible. Of course, if the rain is coming down so hard that you can’t see anything, find a safe place to pull over and wait it out. Make sure your hazard lights are on so others can see you at the side of the road. 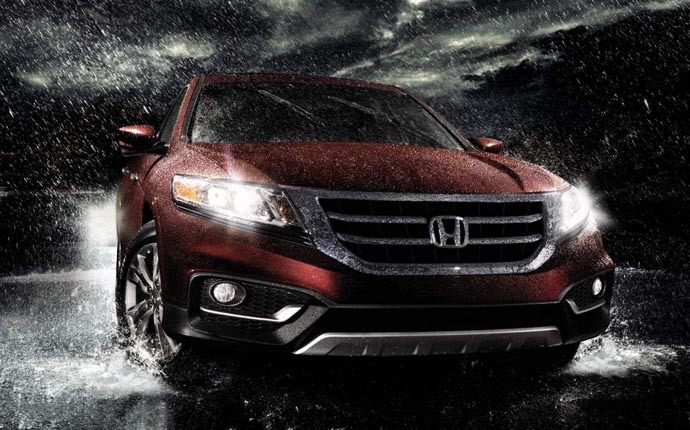 At Henley Honda, we promise you safety, but we can’t control the weather. Use our driving tips to stay safe, and let your Honda and its Top Safety Ratings take care of the rest.